2720 /⊙/ Germany - interesting and extensive lot in the ring binder with numerous good issues. As well French zone 30 Pfg. Constance II, Freiburg souvenir sheet pair twice, American/British Zone export fair souvenir sheet with special cancel, German Demokratic Republik (East Germany) DEBRIA-souvenir sheet, three Marx souvenir sheet used, Berlin with the better first issues, Federal Republic of Germany with beginning valued including Bach seals, St. MaryÂ´s Church twice, Wuppertal series, 30 Pfg. Welfare 1952 and so on. Perfect for liquidation, very favorable valued! 2740 /⊙ 15/28, 1/19 Germany - nice almost exclusively mint never hinged collection from the subscription \"view IN the world\" in the Borek hingeless printed form ring binder. With also numerous mint never hinged issues older values including Thurn and Taxis, German Reich, German occupation Schleswig Michel no. 15 / 28 mint never hinged, Soviet Zone farewell issue from MECKLENBURG-WESTERN POMERANIA on good white paper both mint never hinged as also neat cancelled, Bohemia and Moravia Michel no. 1 / 19 mint never hinged and numerous further issues. Very high catalog value respectively acquisition price! 3300 /⊙/ Germany - extensive collection in four Schaubek albums. As well an extensive part Soviet Zone including good souvenir sheets, German Demokratic Republik (East Germany) with beginning valued, German local issue, Old German States, much German Reich including International Postage Stamp Exhibition souvenir sheet, French zone and New Saar well-staffed, Berlin with all beginning valued including monetary sovenier sheet, Federal Republic of Germany abundant with beginning valued and so on. Please have a look! 3320D xeF Germany - extensive inventory in 16 albums and stock books accommodated, as well numerous issues German Reich, allied occupation / American/British Zone with useful issues, Federal Republic of Germany with good beginning valued, Berlin with better values from the black overprint set, as well also an interesting part Soviet Zone / German Demokratic Republik (East Germany). Please check carefully! 3324 /⊙/ /✉ Germany - extensive collection in five albums formed. As well an extensive part Soviet Zone / German Demokratic Republik (East Germany) including better issues, Berlin with beginning valued, an abundant part French zone, New Saar with flood souvenir sheet pair, American/British Zone, Federal Republic of Germany with the first issues. Please have a look! 3326 ✉/ /⊙/ Germany - interesting lot in the ring binder accommodated. As well better material as for instance German Reich Zeppelin covers, charity souvenir sheet Nothilfe unused, Ostropa souvenir sheet on cover with shipÂ´s mail stamp, further souvenir sheets of the German Reich and so on. Please have a look! 3327 /⊙/ Germany - extensive inventory in 18 albums / stock books accommodated with a lot of interesting material, numerous better issues, as well Federal Republic of Germany all beginning valued twice collected including posthorn set, a very good part American/British Zone, French zone very fine occupies, an extensive part Soviet Zone including better issues and so on. Please check carefully! 3329 /⊙/ Germany - interesting and extensive inventory in 11 albums / stock books accommodated, only older material. As well an extensive part Old German States, numerous issues of the German colonies, a strong part German Reich including one extensive collection with useful issues, as well German occupation II. World war. Please check carefully! 3332 ⊙/✉/ Germany - superb collection in two Borek spring back binders formed with numerous sought-after issues and many better values. As well a strong part German Reich 1872 / 1945, frequently even twice collected clean unused respectively used included are also all Zeppelin series, furthermore also Zeppelin covers, all souvenir sheets including charity souvenir sheet Nothilfe in original size and many further better issues. Furthermore a very nice part German colonies with lots of better values, complete sets, Mark value and some German occupation I. World war. A magnificent object! 3354 /⊙ Germany / Switzerland - interesting lot on stock cards with useful issues, as well German Reich including Michel no. 95 AII mint never hinged with photo expertize Jäschke-Lantelme BPP, Switzerland with useful souvenir sheets, PAX set mint never hinged and so on. Please have a look! 3365 /⊙ Germany - very nice lot on stock cards in a box accommodated. With also sought specialties, a strong part Berlin beginning years, as well souvenir sheet 1 I with first day special cancel expertized Schlegel BPP, Michel no. 112 / 13 and 121 / 23 in blocks of four with house order numbers mint never hinged, Federal Republic of Germany with useful posthorn values, good blocks of four and so on. Perfect for liquidation! 3366 /⊙ Germany - nice lot souvenir sheets in a box accommodated on stock cards, as well better issues as for instance Soviet Zone large Christmas souvenir sheet in both paper types, allied occupation help for the aged souvenir sheet pair multiple mint never hinged respectively used and so on. Please have a look! 3369 /⊙ Germany - magnificent lot in two boxes accommodated on numerous stock cards, as well the Federal Republic of Germany beginning years very represented strongly with a wealth better sets, with also many margin copies and corners of the sheet, blocks of four from the corner, with also two examples the 30 Pfg. Stephan with sheet numbers, four posthorn sets, as well also an extensive part French zone. Must see! 3371 x Germany - interesting inventory with better material, as well Federal Republic of Germany posthorn stamp booklet sheet no. 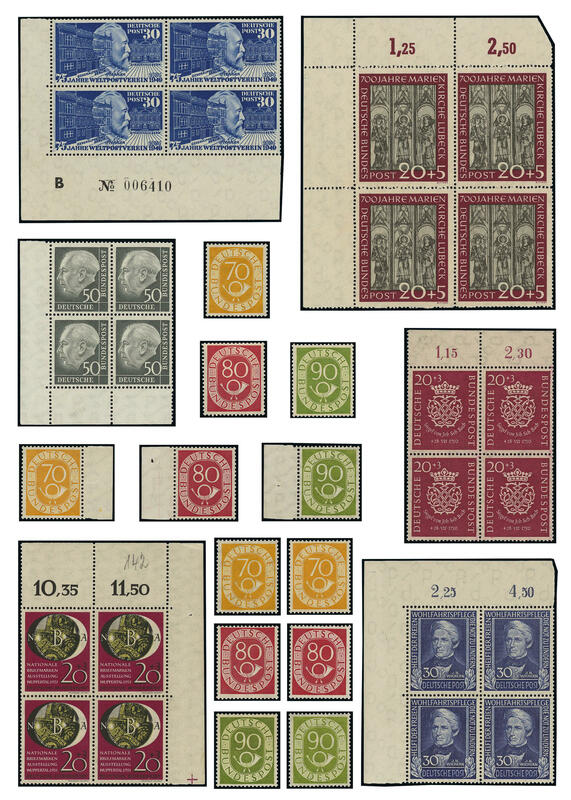 1 (as usual prefolded), a collection Soviet Zone with all souvenir sheets, Berlin with all beginning valued mostly twice collected including monetary sovenier sheet, collection Federal Republic of Germany with posthorn set and so on. Please have a look! 3388 ⊙/ / Germany - interesting lot in three large stock books accommodated. As well a nice part German colonies including better values. Please have a look!